John Crowley was born in the appropriately liminal town of Presque Isle, Maine, in 1942, his father then an officer in the US Army Air Corps. He grew up in Vermont, northeastern Kentucky and (for the longest stretch) Indiana, where he went to high school and college. He moved to New York City after college to make movies, and did find work in documentary films, an occupation he still pursues. He published his first novel (The Deep) in 1975. Since 1993 he has taught creative writing at Yale University. In 1992 he received the Award in Literature from the American Academy and Institute of Arts and Letters. Learn more at John Crowley’s blog. The Aegypt Cycle — (1987-2007) Publisher: Pierce Moffett is an unorthodox historian and an expert in ancient astrology, myths, and superstition. The land that Moffett studies is not the real, geographical Egypt but Ãegypt, a country of the imagination. When Moffett discovers the historical novels of local writer Fellowes Kraft, his course is charted. Kraft’s books interweave stories of Italian heretic Giordano Bruno, young Will Shakespeare, and Elizabethan occultist John Dee — stories that begin to mingle with the narrative of Moffett’s real and dream life in 1970s America. As Moffett’s journey in and out of his comfortable reality continues, what becomes clear is revelatory: there is more than one history of the world. In a world very different from ours, two powerful factions fight for the throne. Alliances are made and shattered. Vows are sworn and broken. Brothers betray brothers; fathers betray sons; kings are imprisoned and queens make war. No, it’s not A SONG OF ICE AND FIRE. 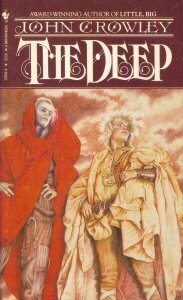 It’s The Deep, by John Crowley, published in 1975. The Deep is Crowley’s first novel. It is unlike his other works, although certain themes come back into play in the AEGYPT QUARTET. At first it seems like it is based on the Wars of the Roses, but Crowley has said in interviews that he was inspired by the short reign of King Edward II. Fey, muted, beautiful. The story of Rush-that-speaks is a bildungsroman that will haunt you long after you have read the last page. 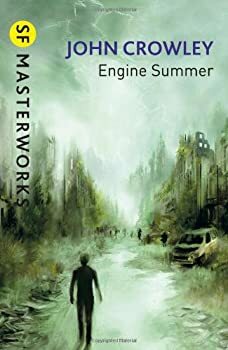 Engine Summer follows the charming and inquisitive Rush as he grows up in his enclave of 'True Speakers,' one of the few groups of humanity left after an apocalypse has destroyed most of civilization. It then follows him as he ventures out into the world to see what strangeness it may offer, and in the hopes of finding his lost love. "All Part of the Tale. Don’t Ask Me How…"
This review is going to be well-nigh impossible to write, as the subject matter is so impossible to describe. 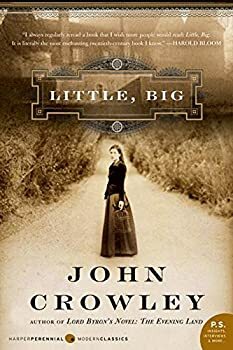 Well, John Crowley's Little, Big is definitely a book. That's a good start. But the second I try to narrow down rudimentary elements like plot and character, my brain gets a bit fuzzy. It's about a family. And a house. And how this family lives in the house which is situated on the borders of another world which sometimes intrudes upon their own, and so is aptly named "Edgewood." Beyond that, it gets more complicated. Or maybe simpler. It's hard to be sure. In 1990, Great Work of Time won the World Fantasy Award for best novella. 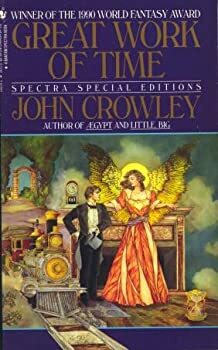 I’m surprised someone hasn’t snapped up John Crowley’s short book, given it a glossy steampunk cover, and re-released it. Of course it isn’t steampunk. John Crowley’s work doesn’t fit easily into any sub-genre except Things John Crowley Has Written. Still, Great Work of Time has enough of the British Empire, airships, alternate histories, train terminals, misty London cityscapes, and men with bowler hats and tightly furled umbrellas to justify a steampunk cover, which might introduce a whole new generation of readers to this unusual and powerful writer. 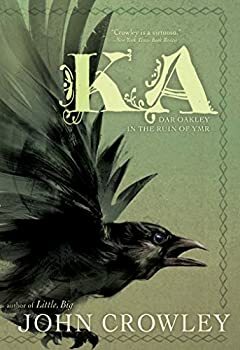 Ka: Dar Oakley in the Ruin of Ymr (2017) is a brilliant novel. It is lovely, eerie, and heartachingly elegiac. It is also deeply weird. CLICK HERE FOR MORE BY JOHN CROWLEY.